Students at Stella Maris College in Gżira will no longer have an excuse for being late for lessons. Next week, the world’s largest human sundial will be laid out in their school yard and, just by standing on the meridian line in the middle, they will be able to tell the time by the length of their shadow. The school’s Astronomy Association initially came up with the idea and it was immediately taken up by science teachers, who believe it will help students understand equinox and summer solstices and the movement of the seasons. “Our engineering teachers designed the sundial which is a combination of astronomical and technological,” said Brother David Mizzi, the school director. The seven by four-and-a-half-metre sundial is aligned with the axis of the Earth’s rotation to tell the correct time: as the sun moves across the sky, the shadow-edge aligns with different hour-lines. It will be laid out in the secondary school yard, although Brother David stressed that this will not take up any of their play area. 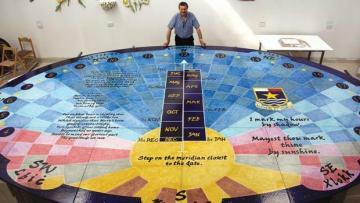 “It is a floor sundial, and the material is hardwearing – so it can take the running around of children on it,” he said. The maker of the sundial – David Grima of Mediterranean Ceramics – said that it took a month of non-stop work by three of his staff to complete the handmade dial. It weighs more than a ton and, after it is treated, fired, sprayed and decorated, it can take wear and tear for more than century. “It is very durable stone – it can take up to minus 100˚C and over 100˚C – and the colours won’t fade even after a hundred years,” said Mr Grima, who has been in the ceramic industry for the past 30 years. “We are corresponding with the Guinness Book of Records as there is no other known human sundial made out of volcanic stone which is this size,” he added. The students, who are waiting eagerly for the sundial to be laid down, will also not need to worry if they forget the lyrics of their school’s anthem – it is there, hand-painted on the giant sundial, together with an apt observation: “I mark my hours by my shadow”. The earliest sundials known from the archaeological record are the obelisks built about 3500 BC and used in Egyptian astronomy. However, it is believed that humans were telling time from shadow-lengths at an even earlier date although there is no hard evidence for this. Sundials are mentioned in the Bible and the Roman writer Vitruvius lists dials and shadow clocks known at that time. Italian astronomer Giovanni Padovani published a treatise on the sundial in 1570, in which he included instructions for the manufacture and laying out of wall and floor sundials.